Secondary Inscription: At bottom left, inscribed "CSL" in brush and brown ink by a later hand. The reposing lion has been disturbed and lets out a ferocious roar revealing its sharp teeth and thick, leathery tongue. With its head tilted slightly upward, light sparkles off the nose, eyes, and left side of its face. The animal's immense front paws are also illuminated from the upper left. By contrast, much of the lion's chest is covered in dark shadows where Cornelis Saftleven used black and brown wash to soften the animal's fur. 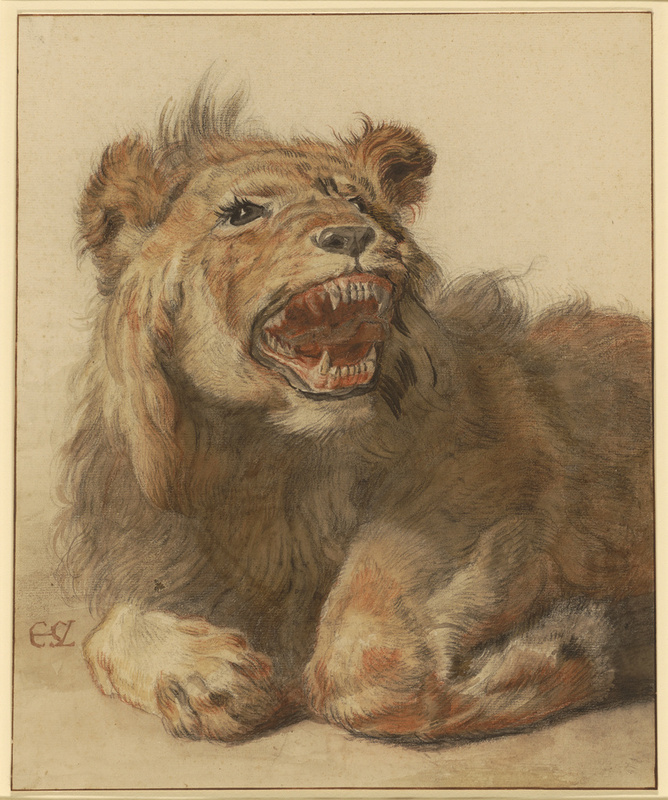 Dutch artists in the 1600s could study exotic animals--like this North African lion--at fairs and markets, traveling circuses, or one of several menageries or zoos. But artists did not always have the opportunity to work from life and sometimes relied on stuffed animals or the work of their contemporaries as models. This fearsome lion's powerful and animated presence suggests that Saftleven drew it from life. The artist was fascinated by animals and produced both fanciful animal allegories and detailed studies of lions, leopards, owls, and monkeys. This work is among the largest and most elaborate of Saftleven's animal studies and was probably intended as a finished work.